When your dog’s unwell and you’re not sure why, it can leave you looking for clues everywhere. Could the answer be in your dog’s food bowl? Perhaps. Like humans, dogs can be allergic or intolerant to particular foods. Only 10% of all allergies in dogs are food-related, so it can take a bit of sleuthing to work out what’s going on. But if your dog does have a food allergy, there are things you can do to start tackling the problem. How can I tell if my dog has a food allergy? But these symptoms are linked with lots of other causes too. That can make allergies difficult to diagnose – especially when it comes to distinguishing a food allergy from an environmental allergy, or an allergy from a food intolerance. The allergy-intolerance distinction isn’t always straightforward, as the symptoms can overlap. Our recommendation: visit your vet. They’ll help you work out if your dog is suffering from an allergy, an intolerance, or something else. A good first step in tackling a suspected reaction is to switch your dog to a hypoallergenic diet. This means cutting out these five most common allergy culprits, so your dog is less likely to suffer a reaction. When working out the cause, try to keep an open mind. Environmental allergies share a lot of the same symptoms as food allergies, and are much more common. Not only that, but dogs can have both types of allergy at once, which can throw you off the scent if you’re only focused on food. Can you test dogs for a food allergy? Blood tests for food allergies do exist, but the results can be unreliable. The best way to diagnose a food allergy or intolerance is with an exclusion diet. This means cutting out as many potential triggers as possible, and then reintroducing them one by one. This helps you spot patterns in what your dog eats, and what symptoms develop. To be reliable, an exclusion diet needs to be done carefully, so always get advice from your vet before you start. Tailor-made food can work well for dogs on an exclusion diet – it makes it easy to give the nutritional balance your dog needs, while leaving out any ingredients that are off the menu. 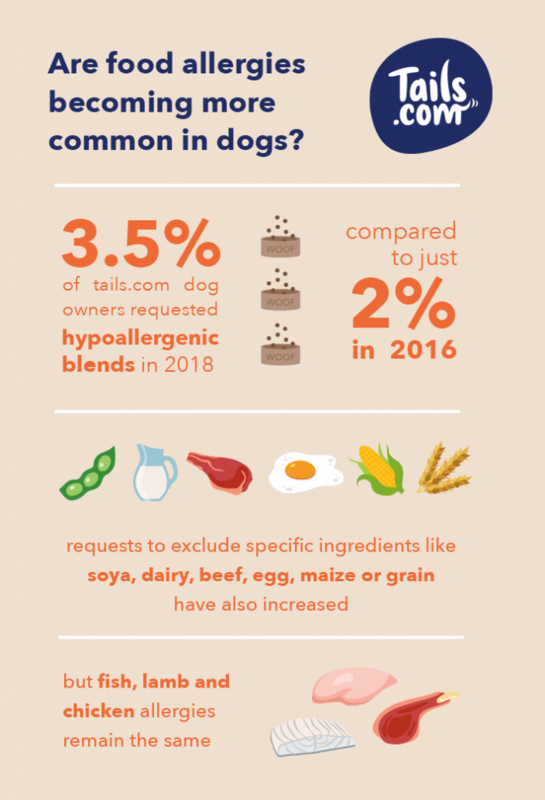 To keep things easy to manage, every tails.com dog gets an online profile where owners can track and update the ingredients they’ve excluded in just a few clicks. How can I treat my dog’s food allergy? Once you know what’s causing your dog’s reaction, you can remove that food from their diet. This should dramatically improve their health, but you won’t see a change overnight. It can take two to three months for a reaction to subside. It’s important to let any changes to your dog’s diet take hold – chopping and changing too often will only add confusion. To avoid a specific ingredient, you’ll need to know what’s in everything your dog eats. This is time-consuming but worth the effort, as even the tiniest amount can trigger a reaction and leave you having to start the three-month process again. Tails.com customers avoid all that label reading, because we do this for them – tailoring their dog’s dry food recipe around their dog’s allergy or intolerance, and checking their tails.com wet food and treats are suitable too. If you tell us your dog has skin issues or digestive symptoms, we can include supportive ingredients in their blend – for example, prebiotics to support healthy gut flora, or omega fatty acids to help soothe itchy skin. Most food allergies are related to animal proteins, not wheat or grains. 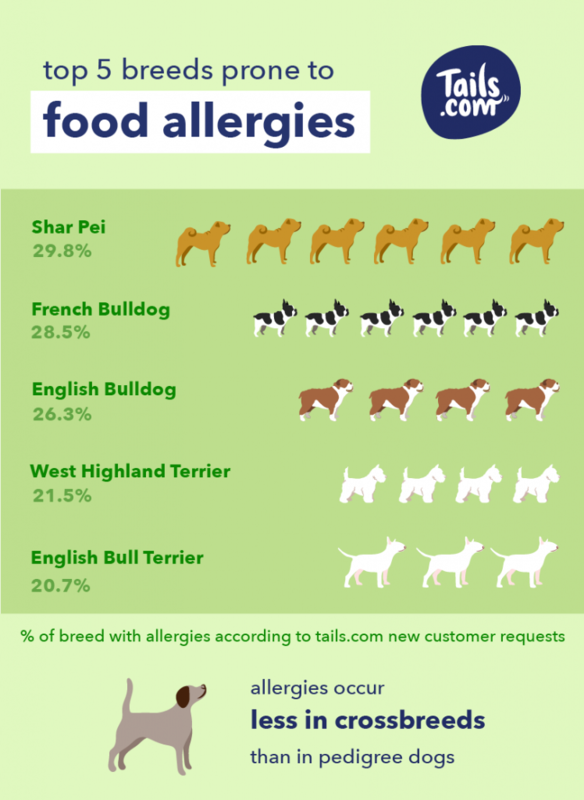 But if you think your dog’s problem is grain-related, a good first option is to ask for your dog’s recipe to be made without wheat: the most common plant-based allergen. If that doesn’t improve your dog’s symptoms, you can choose to exclude all grains: rice, oats, barley and maize – though these ingredients are less commonly associated with allergies in dogs. Getting your dog back to full health after their allergy symptoms develop can take a bit of trial and error, but you don’t have to do this alone. 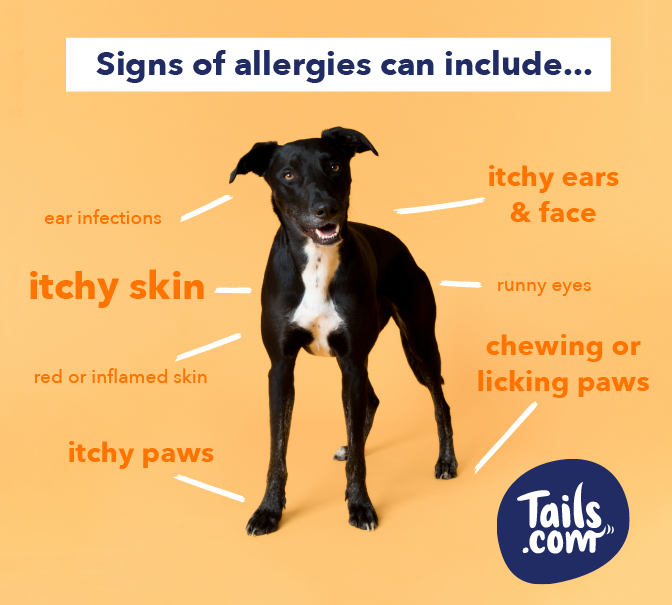 Your vet can help you navigate the options, and our vet and nutritionist team are experts in all things allergy-related – if you’d like some tailored advice get in touch hello@tails.com. Ebony was very sick with diaroea too for around a month. You gave me a 2 week supply of Sensitive stomach food, which along with an injection and pre-biotics have sorted the problem out. Her delivery of food is almost due, but what is the best option? Pre-biotic food OR Sensitive stomache food OR try her back on what she was having?? Please can you help suggest the best way forward for her next delivery? We’ll be happy to help out with this and make sure everything’s just right for Ebony. Can you send us an email to hello@tails.com so our team can help out?